Probably the most advanced automobile manufacturer in America during the post-WWII years was Crosley, a radio and refrigerator manufacturer. They pioneered the production of quality small cars for a nation raised on cheap fuel and high speed. 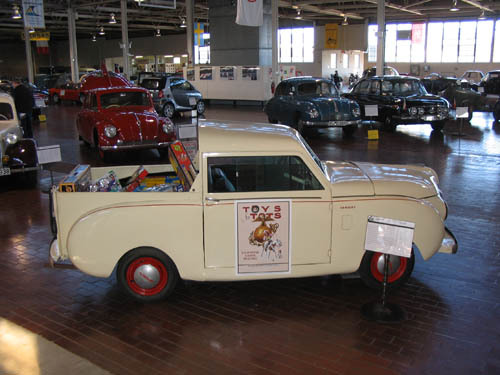 The first Crosley car made its debut at the 1939 New York World’s Fair. In 1940, a station wagon, sedan, panel-delivery truck, and a pickup truck were added to the Crosley line. During World War II, Crosley built special-purpose vehicles for the military. After the war, production resumed and products would be marketed through department stores as well as 150 franchised dealers. Crosley strived to be the lowest-priced car on the U.S. market. With other automobile manufacturers unable to meet demand, Crosleys were popular and over 28,000 were sold in 1948 alone.